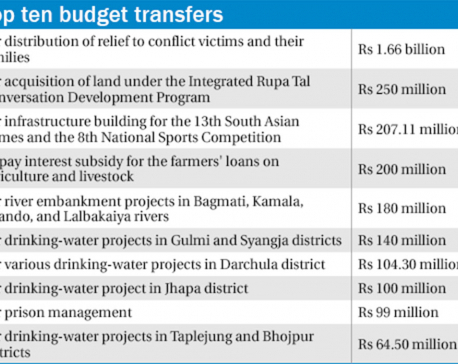 KATHMANDU, July 15: The government has paid out Rs 46 billion in just three days (Thursday to Saturday), according to spending records at the Financial Comptroller General's Office (FCGO) updated at 6:39 p.m. on Saturday. The eleventh-hour bulk payments raised misgivings about the possibility of irregularity and misappropriation. Interestingly, the daily budgetary status was held up for about an hour and was put up again only at 6:39 p.m.
Payments of about Rs 1 billion were made after 5:12 p.m. Treasury offices nationwide were kept open on Saturday, the last day of the fiscal year, and cheques worth Rs 6.2 billion issued. These can be cashed by mid-August. Treasury offices nationwide were kept open on Saturday, the last day of the fiscal year. The payments in the three days for capital expenditure increased by Rs 34 billion while the amount paid for recurrent expenditure was Rs 11 billion. The spending over the three days pushed up the capital expenditure by 11 percentage points to 65 percent (Rs 203 billion) out of the total allocation of Rs 311 billion, according to figures with the FCGO. The spending by Wednesday office hours was only Rs 168 billion (54 percent). Payments for capital expenditure were Rs 35 billion in the last seven days of last fiscal year. Overall capital spending was only 61.78 percent last year. A total of Rs 822 billion (78.44 percent) has been spent out of the Rs 1,048 billion budget for the fiscal year. A total of Rs 516 billion has been spent out of Rs 617 billion allocated for recurrent spending. This comes to 83 percent. Ram Sharan Pudasaini, spokesperson at the Ministry of Finance, said not all such payments at the eleventh hour may have been misappropriations but the payments need to be scrutinized considering the volume. Pudasani also admitted that they would be looking into the issue, collecting the data on payments and checking whether such payments were made after execution of the works paid for. Despite the low performance in terms of spending, the government has met its revenue target for the fiscal year. According to revenue data, a total of Rs 607 billion has been collected, which is 107 percent of the revenue mobilization target of Rs 565 billion. Revenue Secretary Shishir Dhungana attributed the high figure to rise in economic activity and the capital gains tax collection from Ncell. Revenue collection was Rs 481 billion last fiscal year, or 96 percent of the target.